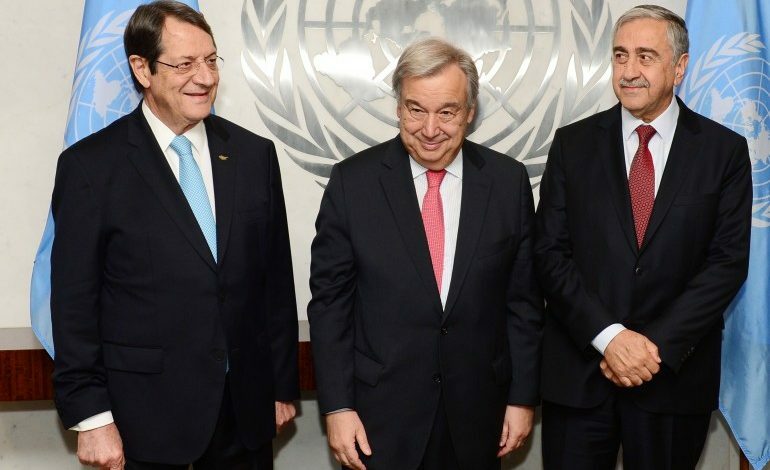 UN Secretary General Antonio Guterres has said that in the coming period, he intends to send a senior United Nations official to conduct in-depth consultations with the parties in the framework of the efforts to solve the Cyprus issue. As CNA UN Correspondent Apostolos Zoupaniotis reports, in the advance copy of the Good Offices Mission Report of the Secretary-General that was submitted to the members of the Security Council, Antonio Guterres says that he believes there is still scope for the sides to act responsibly and decisively in order to chart a common way forward for the island. “In the coming period, I intend to send a senior United Nations official to conduct in-depth consultations with the parties. The consultations will provide a more formal, structured, and detailed channel for the parties to convey to the United Nations the outcomes of their reflection since Crans-Montana and to help determine whether conditions have or have not matured at this stage for a meaningful process. I encourage the parties to recognize the importance of this exercise and to seize the opportunity accordingly”. He recalls that when meeting with both leaders bilaterally in New York in September 2017, “I reiterated the United Nations’ commitment to Cyprus, including the availability of my good offices for the sides to resume the talks as soon as they demonstrate their readiness to re-engage. During the reporting period, I also was in contact with senior representatives of the guarantor powers”. “To both the leaders in Cyprus and to the guarantors, I continually expressed the willingness of the United Nations to support the process if and when they were ready to resume meaningful talks with the requisite political will,” he adds. The UNSG notes that during the reporting period, his Deputy Special Adviser on Cyprus continued to meet separately with the two leaders on the island. Referring to President of Cyprus Nicos Anastasiades, he says that he “repeatedly confirmed his publicly stated position that he was ready to negotiate on the basis of the framework that I put forward in Crans-Montana, subject to good preparations for a possible reconvening of the Conference on Cyprus, including through shuttle diplomacy”. “He clarified, however, that no negotiations could take place while “Turkish provocations” continued in Cyprus’ Exclusive Economic Zone”. As regards the Turkish Cypriot leader Mustafa Akinci, he notes that “Mr. Akıncı also confirmed his commitment to the six-point framework that I introduced at Crans-Montana to resolve the core outstanding issues in a strategic package. He indicated, however, that he would not take part in “open-ended” negotiations; he stood ready to engage in “time bound, well structured, and results oriented” talks”. With respect to the guarantor powers, the UNSGS says that in public statements since July 2017, Turkey has expressed doubts as to the possibility of reaching a settlement based on the established parameters, given the Crans-Montana outcome and past failures, adding that Turkey has nonetheless reiterated its support for a “sustainable settlement” of the Cyprus issue. Greece, for its part, Guterres says, has reiterated its commitment to finding a just and lasting solution to the Cyprus problem on the basis of United Nations Security Council resolutions “and the framework that I had set down in Crans-Montana”. Finally, he notes that the United Kingdom has emphasized its strong support for a comprehensive settlement and its readiness to do its part to achieve that goal. As regards the informal meeting of the two leaders on the 16 April 2018, Guterres notes that the two leaders met in the United Nations Protected Area for an informal meeting, under the auspices of my Deputy Special Adviser and that both leaders underscored that the meeting did not constitute a resumption of negotiations but did provide an opportunity to ascertain “where they stood” currently on the Cyprus issue. At the end of the informal meeting, the leaders confirmed that they remained at an impasse, he notes, adding that “it was nonetheless acknowledged that the meeting had been important and necessary after nearly 10 months without direct contact between the leaders. As noted in a statement issued by the Deputy Special Adviser following the meeting, the leaders had a frank and open exchange of views during a two-hour tête-à-tête discussion”. “Mr. Akıncı added that, through announcing it as a strategic agreement, the negotiations would be meaningful as they would be held with the aim of filling the gaps under the strategic agreement”. The UNSG’s report says that in response, “Mr. Anastasiades issued a written statement, on 2 May 2018, in which he replied that if Mr. Akıncı accepted the framework of Mr. Guterres, “as it was presented to the sides on 4 July 2017, this is a positive development”. He called on Mr. Akıncı, and “primarily Turkey” to “clarify whether they accept” specific provisions of the framework related to security and guarantees and foreign troops”. “These statements led to a further public exchange between the sides that suggested that the leaders had diverging interpretations of certain aspects of the framework. The consultations which I intend to launch through a senior UN official in the coming weeks will provide an opportunity for the sides to formally clarify where they stand on this issue” he stresses. The UNSG notes that “it is my firm belief that, for a process of such complexity and political sensitivity to be successful, a balanced and comprehensive package approach on specific key issues needs to be followed”. “Should the sides jointly decide to resume talks, the six-point framework that I introduced in Crans-Montana on 30 June 2017 could form the basis for negotiations aimed at reaching a strategic agreement and paving the way for the comprehensive settlement. The framework contained elements related to territory, political equality, property, equivalent treatment, and security and guarantees. I introduced it in an attempt to help the parties resolve the remaining core outstanding issues interdependently and overcome the challenge of negotiating across chapters”. Referring to the “tensions over hydrocarbon activities”, he says that they “began to escalate in early 2018. Most significantly, on 9 February 2018, the Italian energy company ENI was prevented from accessing a planned drilling area in Cyprus’ Exclusive Economic Zone by Turkish military ships. In mid-March, the ENI drillship departed the Eastern Mediterranean without having been able to conduct its intended exploratory drilling”. On the same issue, “with respect to the disputes over hydrocarbons off the coast of Cyprus, I continue to monitor developments closely and with concern. I reiterate that natural resources found in and around Cyprus should benefit both communities and should provide a strong incentive to find a durable solution to the Cyprus problem”. The UNSG underlines that “I recall that the Greek Cypriot leader and the Turkish Cypriot leader have previously agreed in their negotiations that natural resources in a unified Cyprus would lie within the competence of the future federal government. With new rounds of exploratory drilling expected to take place before the end of the year, I urge restraint and reiterate my call for a peaceful resolution of differences and for serious efforts to be made to avoid any further escalation and defuse tensions”. He notes that “with significant hope and expectations raised during the 2015-2017 phase of the negotiations, the continued absence of dialogue nearly one year after Crans-Montana and the uncertain prospects for the future are a serious cause for concern for many Cypriots and the international community alike”. I remain convinced, he adds, that a comprehensive settlement would bring substantial benefits and opportunities to both communities on the island and would contribute to overall peace and stability in the region. “At a strategic and political level, a settlement would help repair decades of division and mistrust, soothe tensions that might escalate into conflict, and assist in cultivating neighbourly relations between traditionally adversarial countries in the eastern Mediterranean”. In his report, the UNSG says that the future of the island is a responsibility of all Cypriots, but the leaders bear the primary responsibility for the negotiations, adding that should they jointly agree to resume talks with the intent of agreeing on a comprehensive settlement, the leaders will need to demonstrate the strongest political commitment, courage and determination. “They will also need to recapture their sense of urgency, address the erosion of trust and deliver strong and unambiguous signals of political will. To be able to conclude a mutually beneficial deal, they will need to engage their communities and explain the benefits of the solution, as well as the importance of compromise on both sides”. Referring to the guarantor powers, he points out that they will also, without doubt, need to do their part and engage in a determined and constructive manner. “Furthermore, the Security Council —and, indeed, all friends of Cyprus, particularly the European Union —will need to increase their support and encouragement to the leaders and all parties concerned. They will need to continue to speak clearly and with one voice about the opportunities and benefits of a comprehensive settlement but also, and unequivocally, about the risks and costs of the status quo or backsliding from the gains already made”, he concludes. 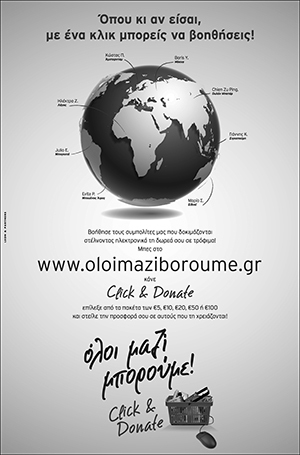 The report on his mission of good offices in Cyprus focuses on developments from 12 August 2017 to 21 May 2018. The report will be issued as a document of the Security Council under the symbol S/2018/610. Previous article Academy Award Winner George Chakiris receives Honorary Orpheus Award at the 12th Annual Los Angeles Greek Film Festival.